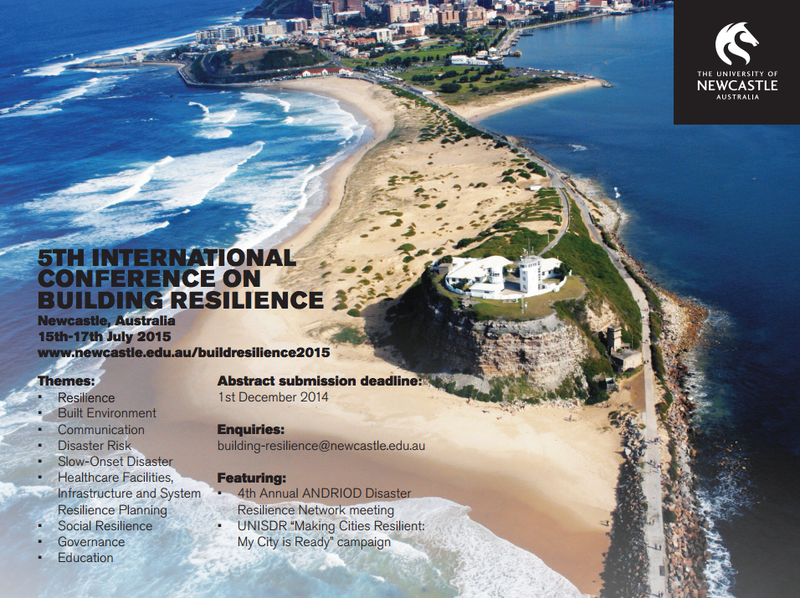 Thank you to all who have submitted abstracts for the 2015 International Building Resilience Conference from 15-17 July 2015. We look forward to welcoming a diverse group of international delegates to Newcastle and we are pleased to announce that our keynote speakers will be Professor Kevin Hall (Deputy Vice Chancellor, University of Newcastle), Professor Makarand Hastak (Head of Construction Engineering and Management, Purdue University) and Dr Louise Brooke-Smith (Global President, RICS). The abstract deadline has now been extended until 5th January so there is still time to get involved! Click here to find out more. Delegates from the University of Newcastle and Beijing Normal University are currently in Taipei for the second REACT Network event. There is a full schedule planned, including research collaboration meetings, studio-based consultations with students, formal seminars and community resilience field visits. Ming Chuan University will kindly host the visit. Dr von Meding and Dr Gajendran will be attending the 5th World Conference on Disaster Risk Reduction (WCDRR) in March as official delegates of the CIB (International Council for Building). CIB W120 Disasters and the Built Environment, the University of Newcastle and Loughborough University will host and facilitate a special public 'Built Environment DRR Research Forum'. The Forum will showcase research from around the globe that has supported the goals of the Hyogo Framework for Action over the past decade, informing the post-2015 framework with empirical and theoretical advances. A panel of international speakers will share a wealth of evidence spanning hundreds of research projects over the past decade. A team from the group, led by Dr Gajendran, were recently successful with a proposal to fund collaborative meetings with a UK SME (Ostick & Williams Architects, Belfast). The meetings, hosted in Newcastle, will explore whether the development of a technological tool and operational framework for evaluating built environment resilience to flood events is possible within a digital environment. The staff from O&W will visit Australia in March 2015.